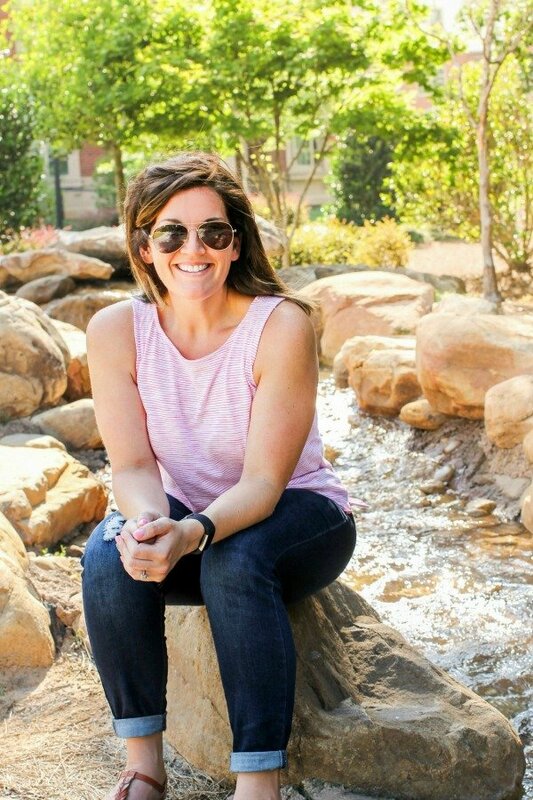 January 5, 2018 By Allyson 8 Comments This post may contain affiliate links. Read my disclosure policy. 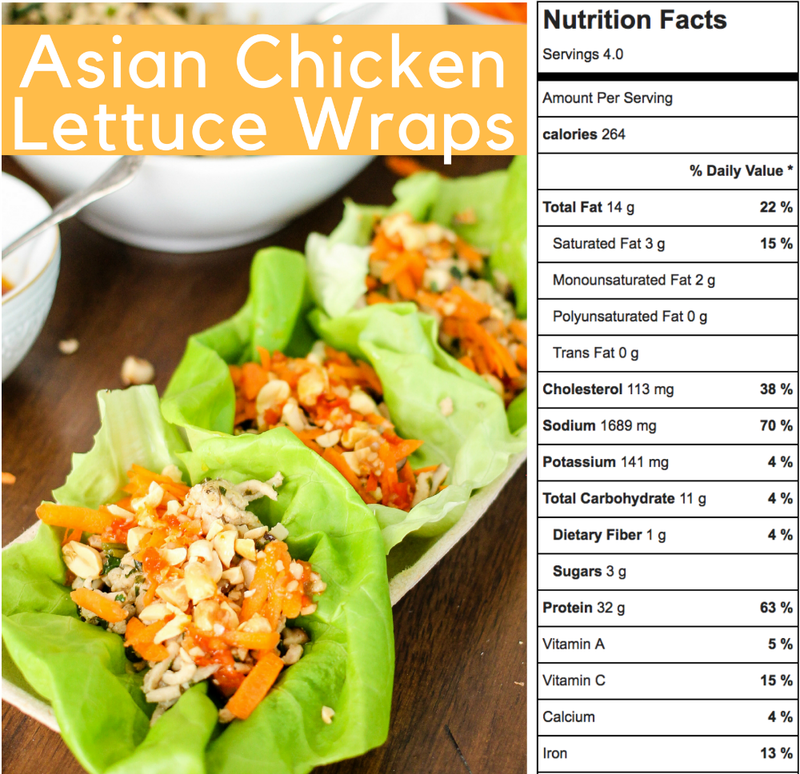 Asian Chicken Lettuce Wraps are super easy to make and taste better than the popular PF Chang’s version. This healthy recipe packs all the flavor! Every time we go out for Asian or Thai, I always check to see if they have some sort of lettuce wrap. They are so delicious, and for the most part healthy as long as they don’t add too much oil (which is common at restaurants). 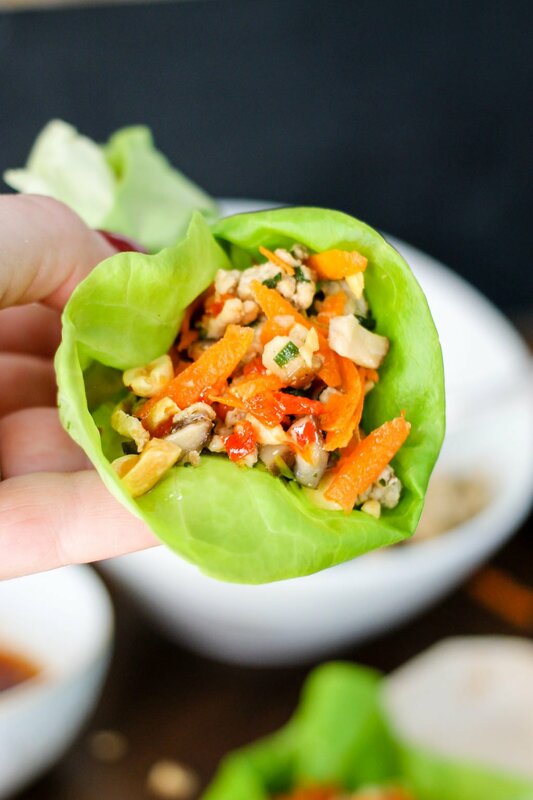 I love making these Asian Chicken Lettuce Wraps at home because I control how much of everything is used in the recipe and only ONE skillet. With only 264 calories and 22 grams of protein per serving (scroll down for nutritional info), this is a dish you can feel good about eating! These Asian Chicken Lettuce Wraps use only one pot or skillet to cook the filling, then you just need a small bowl to mix the sauce. If you wanted to coat the entire dish with the sauce, you could even add it to the skillet and omit the extra bowl. I like having the option to drizzle more sauce over the top of the Asian Chicken Lettuce Wraps. 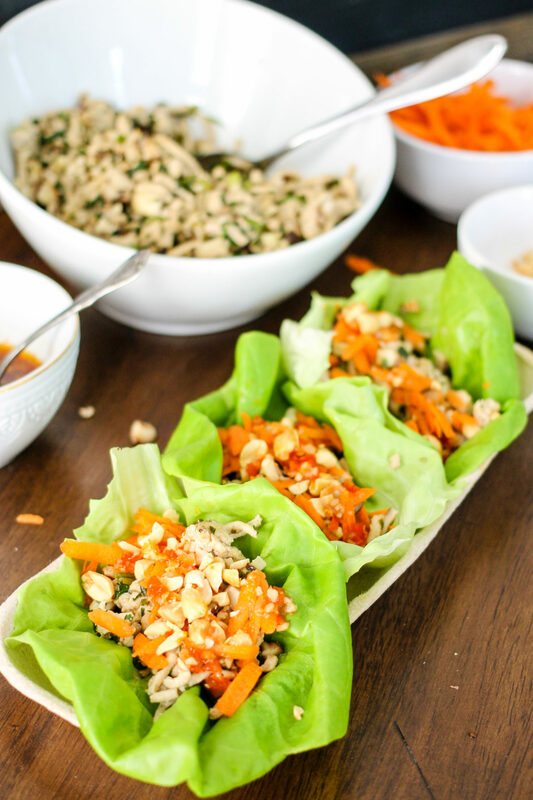 These Asian Chicken Lettuce Wraps only take about 30 minutes from start to finish, and the majority of that hands on time is going to be prepping your vegetables. A great option would be to prep everything over the weekend, and then all you have to do is throw it into the skillet when you are ready to eat it during the week! This is a great recipe for your weekly meal plan because it’s easy, delicious, and takes little time to make. I like using my high sided skillet to make the Asian Chicken Lettuce Wrap. I also highly recommend a great whisk for the sauce! Sheet Pan Asian Chicken and Vegetables only uses one pan and makes a delicious and healthy meal. Great for meal prep and healthy eating! Only 221 calories per serving and can be doubled or tripled for easy meal prep! Ginger Soy Chicken thighs are made in one skillet and simmered in the most delicious asian sauce. This 20 minute meal is perfect for dinner! 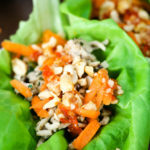 Asian Chicken Lettuce Wraps are super easy to make and taste better than the popular PF Chang's version. This healthy recipe packs all the flavor! Mix sweet chili sauce, soy sauce, garlic, stock, and oil together in a small bowl. Microwave 1 minute or until bubbly; whisk and set aside. Heat large skillet over medium/high heat. Add oil to skillet and then ground chicken. Leave for 3-4 minutes, then break up with a wooden spatula. Cook 3-4 more minutes, or until mostly cooked through. Add mushrooms, cilantro, and green onions; stir to combine. Cook 2-3 minutes. Cut lime in half, then squeeze lime juice from both halves into the skillet. Add salt and stir well. Cook 1 minutes, then remove from heat. Add 2 TBS of sauce to skillet and stir to combine. Rinse bib lettuce leaves and dry. Scoop about 1/4 cup filling into each leaf. Top with shredded carrots, peanuts, and sauce. Enjoy! Don't like meat? Double the mushrooms and call it a day! You can add all the sauce to the skillet if you don't want to drizzle it over the top. If you have picky eaters you may want to leave it all on the side! What a great recipe to start the year! 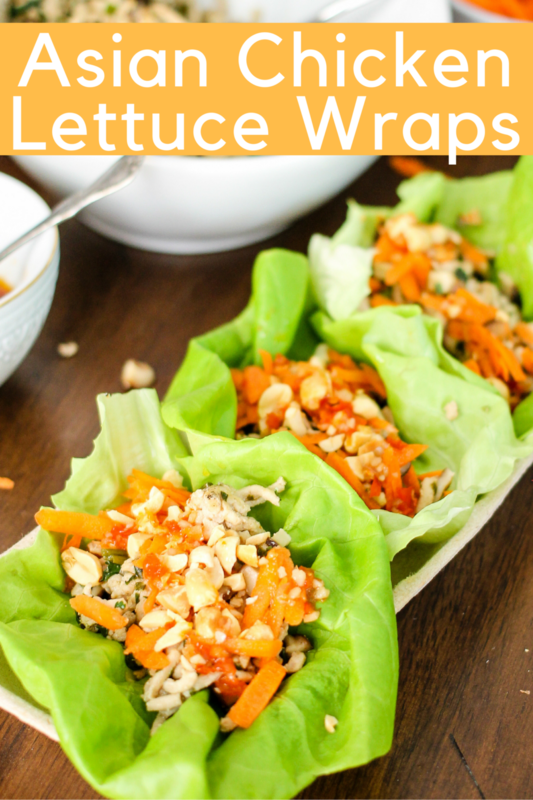 Love making lettuce wraps and these look delicious! One of a few low carb meals that makes me forget it’s low carb! So good! My favorite party appetizer! Taste so good! 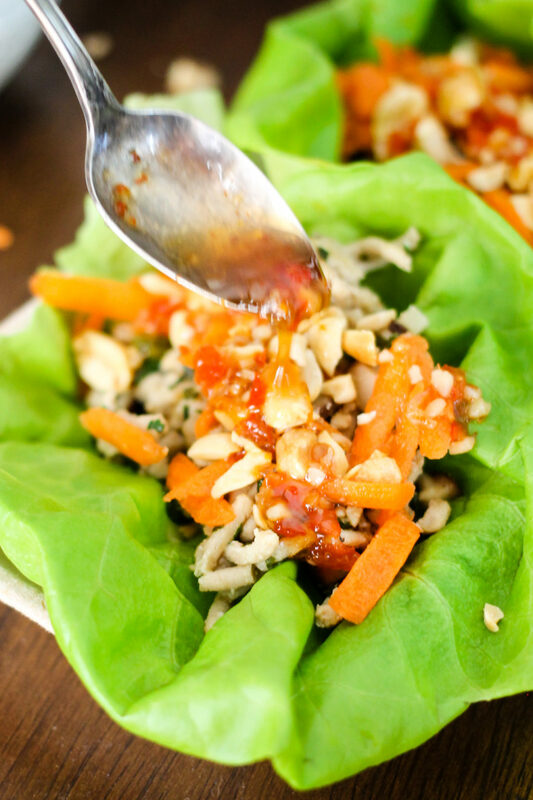 These lettuce wraps are going to be a huge hit here! They are so pretty too! Such a perfect lunch or dinner! And no guilt! These are perfect for tossing out some carbs, but not lacking on flavor! Exactly!!! They are so great and healthy!